On Monday over 230 Lutheran educators from around the Great Lakes Bay Region gathered together to learn, worship, encourage each other, and celebrate their ministry. 24 schools, early childhood centers, and Lutheran organizations were represented at this 8th Annual Lutheran Educators Conference. Michigan District President David P.E. 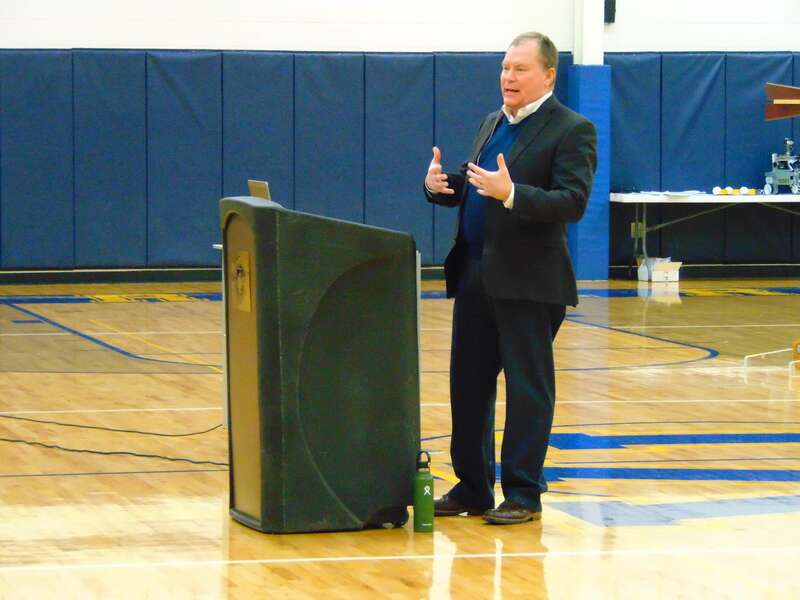 Maier served as keynote for the event, using Jonathan’s battle with the Philistines recorded in 1 Samuel 14:1-14 as a call to action to seize divine moments and step out in faith, taking risks, and allowing the real power of God’s kingdom to be displayed. Maier noted in this passage that while Jonathan didn’t have the authority or the weapons to begin a battle, he had an urgency to fulfill the mission God had called Israel to fulfill. Jonathan didn’t have great battle plans, but he knew that if God was in the battle, God would prevail. Jonathan didn’t even have complete assurance that God would act, as he says in the text, “perhaps the Lord will act on our behalf” (1 Sam. 14:6) But, Maier concluded, “What Jonathan knew was that God was trustworthy…God didn’t need more than two people to win whatever battle God would put them in…one sword was enough to conquer the well-armed Philistines if God was there and asked them to do it. What [Jonathan] didn’t know was how this would turn out.” The same, Maier noted, is true for us. We will never see the full potential of a moment when we step into it. “The person who seizes a divine moment is a person who knows they don’t know everything”, they know that not all has been revealed, and yet is willing to give their life for God’s purpose anyway. To do what God wants, stepping out beyond the safety of the comfort zone, and then see what takes place. Maier admitted curiosity as to how Christianity has become a “stay unless God calls you to go” movement when Jesus’ clear and repeated mandate was to ‘follow me’. His final encouragement to the assembly then was to follow the example of Jonathan – not waiting until you get a ‘go’ but instead ‘go unless you get a no’. To go, redeemed by the blood of Jesus and transformed by the power of the Holy Spirit, into the darkness of this world and allow God to work miraculously. Following the keynote, participants attended a variety of break-out sectionals on topics including Biblical Evangelism, Math for Struggling Students, Grant Writing for the STEM Classroom, Autism 101, Financial Wellness, and more. Of the 60 sectionals offered, seven presenters were Valley Lutheran teachers, either present or retired. Representatives from a variety of organizations including Lutheran Special Education Ministries, Bay Arenac ISD, STEM @ Saginaw Valley State University, Michigan Department of the Attorney General, Concordia Plan Services, AXA Advisors, LCMS Michigan District, CAN Council of the Great Lakes Bay Region, Thrivent Financial, Lutheran Church Missouri Synod, and Concordia University Ann Arbor were in attendance to lead sectionals and share their knowledge and experience with sectional attendees. Thanks to the planning committee, sectional leaders, speakers, and generous sponsors for their part in making the conference a great experience for all in attendance.